In Hamlet , a play by William Shakespeare which really requires no introduction, single combat settles a border dispute between the rulers of Denmark and Norway. In Xena , it settles a dispute between the Israelites and the Philistines [ GIANT KILLER (#27)]. Before he is poisoned by his brother, Claudius, the king of Denmark (Hamlet's father) kills the king of Norway. With the king of Norway dead, Denmark gains some contested territory. Which he stood seized of to the conqueror. In GIANT KILLER (#27), David kills Goliath thereby by winning contested lands from the Philistines. Xena says to Jonathan, David, and Gabrielle in a strategy planning session, "I propose a winner take all contest. Me against Goliath." Positive. But I'm not going to do it. need someone to believe in. The previous dialogue in Hamlet leaves one to believe that Hamlet's father was a well respected and loved ruler. A huge vacuum was created at his death. Hamlet saw that King Claudius couldn't fill it. Hamlet knew he couldn't fill it. At least not yet. David also knows that he must fill the vacuum left by his brother. Both Hamlet and BEWARE OF GREEKS BEARING GIFTS (#12) have embattled fortresses. Castle Elsinore, Denmark's seat of power, is on alert. Fortinbras of Norway is stirring up rebellion in the countryside. He seeks to recover lands lost to Denmark in the previously mentioned border dispute as well as seek revenge for the death of his father, the king of Norway. The castle Elsinore watch reports to Horatio. The castle watch in Hamlet discusses the situation with Horatio, Hamlet's best friend. "Now, sir, young Fortinbras, Of unimproved mettle hot and full, Hath in the skirts of Norway Sharked up a list of lawless resolutes , For food and diet, to some enterprise That hath a stomach in 't." This is a more than accurate description of Callisto's army in CALLISTO (#22) as well as her poisonous intent. She rampages about the countryside with her men torching every village in sight, even killing women and children. King Menelaus has laid siege to Troy in order to "rescue" his wife Helen. The siege has lasted ten years by the time Xena and Gabrielle arrive [ BEWARE OF GREEKS BEARING GIFTS (#12)]. The Mel Gibson movie version of Hamlet (Franco Zeffirelli, 1990) begins with the internment of Hamlet's father in the family tomb. Queen Gertrude unveils her face, takes a rosette from her hair, and kisses it. She then places it on husband's body within it's sarcophagus. In THE QUEST (#37), just as Gabrielle is about to enter the hut where Xena's body rests, she takes off the Amazon queen's mask. She moves toward Xena's sarcophagus. Gabrielle takes Xena's chakram, raises it to her lips for a kiss, and then places it atop Xena's sarcophagus. In SINS OF THE PAST (#01), Xena visits her brother's tomb. She places both hands on Lyceus' sarcophagus. Queen Gertrude says goodbye to King Hamlet. Gabrielle says goodbye to Xena. Xena makes peace with her brother Lyceus. Jealousy rears its ugly head in Castle Elsinore and war torn Troy. The play Hamlet begins with Hamlet, the Prince of Denmark, in grief over the death of his father, the king, and shock for the even more recent marriage of his mother, Queen Gertrude, to his Uncle Claudius, who has become the king. Prince Claudius enamored of his brother's wife Queen Gertrude, killed his brother, the king of Denmark. He married Queen Gertrude within a month of the deed. In BEWARE OF GREEKS BEARING GIFTS (#12), Deiphobus longs for Helen, his brother's wife. Taking advantage of the distractions caused by the war with Greece, he kills his brother, Paris, ruler of Troy, and tries to escape with Helen to start a new dynasty. The joy of life has been drained from both Hamlet and Salmoneus. King Claudius and Queen Gertrude ask Hamlet to put away grief, to put off wearing the trappings of woe. Hamlet, confused at what to do over the death of his father and his mother's hasty remarriage, rails against God's law against suicide. Depressed, Hamlet utters his first suicide soliloquy. "How weary, stale, flat, and unprofitable Seem to me all the uses of his world!" After Xena's death in THE GREATER GOOD (#21), Salmoneus, the entrepreneur extraordinaire of seltzer water, finds life flat and unprofitable at the death of Xena. One big pun. 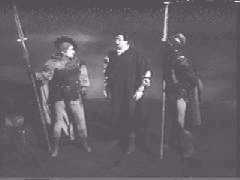 Comparisons in Hamlet become characters in Xena: Warrior Princess . In his first suicide soliloquy, Hamlet compares his father to Hyperion the sun god and King Claudius to a satyr. The Titan Hyperion comes to life after Gabrielle reads a magical scroll in THE TITANS (#07) and Bacchus looks like a satyr in GIRLS JUST WANNA HAVE FUN (#28). Horatio and Gabrielle spend time away from their respective friends, Hamlet and Xena. Upon the battlements Hamlet greets Horatio. Hamlet asks Horatio why he is there and not in school in Wittenberg . Horatio says, "A truant disposition my lord." Gabrielle leaves bard school in THE ATHENS CITY ACADEMY FOR PERFORMING BARDS (#13) to rejoin Xena. Xena asks why. Gabrielle replies, "While others read about adventure, the two of us can be living them." Horatio says that he is there for Hamlet's father's funeral. 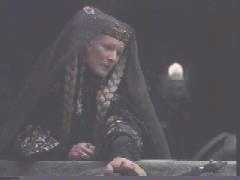 Hamlet suggests that Horatio is there for Hamlet's mother's marriage. And I with them the third night kept the watch. Hamlet takes this as a dark omen. They agree to meet the following night to confront the ghost. In the Sir Laurence Olivier version of Hamlet a blonde Ophelia walks the halls of Castle Elsinore. Gorgeous braids frame her face. In CALLISTO (#22), Xena's arch enemy, Callisto, wears blonde braids which also frame her face. Ophelia wears her braids up while she is sane. Ophelia wears her braids down when she goes mad. Callisto wears her braids down ALL the time. Before leaving for France, Laertes warns his sister Ophelia to stay away from Hamlet as he must marry for alliances and not for love. Polonius, too, tells Ophelia to stay away from Hamlet. Ophelia says she will out of her feelings of duty for her father. Her love for Hamlet is put to the test as he appears to decline into madness. Perdicus asks for Gabrielle's hand in marriage in RETURN OF CALLISTO (#29). Gabrielle must decide between staying with Xena or going with Perdicus. As she watches the once valiant Perdicus slide into a pool of self-recrimination and doubt, she decides to marry him. She feels that it is her duty to heal Perdicus with love. She is swept away in it's madness. Meanwhile, Laertes takes leave of his sister Ophelia. He tells her to stay away from Hamlet because Hamlet must marry for the sake of the kingdom. She will only be hurt in the process. Polonius, the court advisor, says goodbye to his son, Laertes, as well. And you are stayed for. There, my blessing with thee! Bear 't that the opposed may beware of thee. But not expressed in fancy--rich, not gaudy. And dulls the edge of husbandry. Are you finished with my sword? [Taking sword.] This is not a plaything. how I was going to get it. me how to use it. you have to be ready to kill. You don't think I know that. should always be the last resort. The moment you kill... What? "It's wisdom before weapons Gabrielle," sounds like, "Give thy thoughts no tongue, Nor any unproportioned thought his act." "The moment you pick up a weapon you become a target....The moment you kill...everything changes," resembles, "Beware Of entrance to a quarrel, but being in, Bear 't that the opposed may beware of thee." "Four is where you talk your way out of it and I know you can do that," mirrors, "Be thou familiar, but by no means vulgar." I feel that, "To thy ownself be true..." is the most crucial theme in Hamlet and Xena: Warrior Princess . This especially true when it comes to subtext. Whether it is there or not pertains to one's own perception. Let no one tell you otherwise. King Claudius and Xena receive messages of ominous import. Claudius receives a messenger from Fortinbras' uncle who is apparently either an old friend or signatory of the "duel for lands peace treaty." Say, Voltimand, what from our bother Norway? Most fair return of greeting and desires. So levied as before, against the Polack. Callisto sends a message to Xena via Joxer in RETURN OF CALLISTO (#29). She tells Joxer that all future deaths will be on Xena's hands. Yeah, well I turned good. Just like Xena. on out is on her hands as well as mine. Both King Claudius and Xena suffer from missed opportunities inherent in the messages. Claudius is distracted from further investigation of Fortinbras' intent because of Hamlet's madness. Denmark is eventually over run by Fortinbras' men. Xena is distracted by Gabrielle's marriage to Perdicus. Although, the marriage is conducted in haste to allow Xena to attend before going back after Callisto, it is to no avail. "Callisto: Mistress of Havoc" still is able strike before Xena is set to handle her. With juice for cursed hebenon in a vial. Much like the ghost visiting the watch in Hamlet , Ares visits Xena with three dreams within a dream in INTIMATE STRANGER (#31). He pours poisonous thoughts into Xena's mind as she tries to sleep after letting Callisto die in RETURN OF CALLISTO (#29). Xena sees her mother and the death of Callisto at her hands. Xena tries to wake Gabrielle in the second dream but finds a dead Callisto instead. Gabrielle ties to console Xena in the third dream but winds up comparing Hercules' mercy to Xena's instead. Who are you? Ares. What do you want? welcome you back into my fold. executioner? Or am I missing something? you. You were given a chance to reform. A chance you never gave Callisto. Xena, help me please! Don't let me die! You can't let me die. I am you. Xena! I can change! If you did, I can! scared Xena! Help please! Please! Hamlet and Gabrielle both take out their anger on inanimate objects. The ghost asks Hamlet to avenge him but to let Heaven deal with Queen Gertrude for her unseemly haste to remarry. Hamlet swears the watch to silence saying that he will let people think he is mad. Frustrated by his inability to do anything about his father's death Hamlet gives the battlement walls of Elsinore a sound drubbing in the Mel Gibson version of Hamlet . Grief stricken Gabrielle tries to make kindling out of a tree with her staff in THE GREATER GOOD (#21) after finding out about Xena's death. Ophelia's madness begins with Hamlet. He scares her by his appearance alone in soiled and disheveled clothing. Polonius sees the meeting as he lurks in the background. He reports back to King Claudius and Queen Gertrude and tells of Hamlet's madness. He suggests that another meeting be set up between Ophelia and Hamlet. This will give King Claudius a chance to spy. Gabrielle's love madness begins when a bedraggled Perdicus stumbles upon Xena and Gabrielle's camp. He is in the clutches of "delayed stress syndrome." Weary beyond measure of fighting, he tells Gabrielle that it is only the memory of her face that can forestall his dreams of death. He asks Gabrielle to marry him. Over the course of several days Xena gauges the seriousness of Gabrielle's intent. Ophelia meets with Hamlet with the pretext of returning certain remembrances that Hamlet had given to her. Hamlet questions her honesty. Ophelia questions his love for her. He throws the remembrance, a pendant, at the ground in disgust. Xena tells Petracles in A FISTFUL OF DINARS (#14) that she burned his wedding bracelet with the rest of her trash. Petracles tells Xena that he traded her wedding bracelet in return for arms. But at his death he finally gives Xena her wedding bracelet as a remembrance of the love that they once shared. The comic characters in both Hamlet and Xena: Warrior Princess attempt to reel in their respective quarry. King Claudius sends Polonius to spy on Hamlet. Polonius catches Hamlet in the library. does my good Lord Hamlet? Excellent well, You are a fishmonger. I would you were so honest a man. to be one man picked out of ten thousand. That's very true. my lord. In CALLISTO (#22), Callisto sends Joxer to catch Gabrielle. Failing at his first attempt, Joxer tries again and again fails. Gabrielle sits Joxer down trying to talk some sense into him. You've go to be kidding. Callisto. She'll reward me well. happens. Ow, ow, ow, ow, ow. Oh, great, hit a man when he's down. you both times that we met. don't have that warrior thing. Both exchanges deal with honesty. Neither Hamlet or Gabrielle feel that they are dealing with honest men. In the Mel Gibson version of Hamlet , Polonius approaches Hamlet in the castle library. He tries to determine the extent of Hamlet's madness. Hamlet motions Polonius to come closer as if to confide in him. Polonius climbs the ladder to reach Hamlet's side where he is perched atop the stack of books. When Polonius is about half way up the ladder, Hamlet pushes it backwards forcing Polonius to land rather ungracefully. Callisto's fortress consists of ladders reaching to various levels. It is here that Xena and Callisto step up their competition flinging ladders around like toothpicks. Hamlet topples Polonius from ladder. Catch 'o the day. Xena strings up Callisto.